The yak-herding communities in Haa say one of the major challenges for them is the snow leopards threatening their livelihood. They have been losing their yaks every year to the snow leopards, one of the endangered cat species. Last year alone, about 25 cases of snow leopards attack on the juvenile yaks were reported at the Jigme Khesar Strict Nature Reserve (JKSNR) in Haa. “Three or four calves are killed every year by the snow leopards,” Samten Wangmo, one of the members from the community, said. “The forestry officials said they will provide us with compensation and told us to report the case. 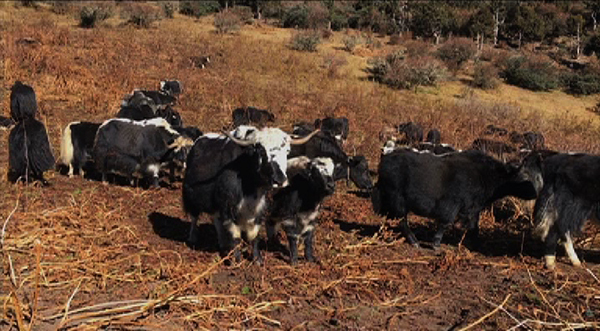 Three of my yaks were killed and this year, a calve was attacked,” Tshultrim Dorji, another from the community, said. The officials at the Jigme Khesar Strict Nature Reserve say currently the affected people were not given any compensation due to the lack of fund in the department. “In future, there are plans to initiate Gewog Environment Committee Fund to compensate the affected people.” Ugyen Tshering, the Forestry Officer of JKSNR, said. The Department of Forest and Park Services (DoFS) also aims to address this issue through the project “Bhutan for Life”, which was initiated with the World Wildlife Fund (WWF), to ensure that Bhutan remains economically and environmentally sustainable. Today with the camera trapping, the park has traced around ten snow leopards in the area. An ambitious countrywide estimate of the snow leopard population carried out in 2017 found 96 snow leopards in Bhutan.